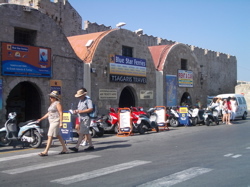 "Car hire in Rhodes - where to find a car rental in Rhodes Greece close to the cruise ship terminal"
Besides taking cruise organized shore excursions, private Rhodes tous, taking a taxi or simply walking to town, car hire in Rhodes is one way of getting around when visiting this island for a day as part of your Mediterranean cruise. Before you decide to rent a car in Rhodes, make sure you know where you are going! If you only want to see the Old town of Rhodes and its top sights, and trust us, there is enough of those to keep you busy for a day, car hire in Rhodes might not be the right solution for you. As a matter of fact, you won’t need any kind of motorized transportation as Rhodes Old town is just across the road from the cruise ship dock which is easy to see on our Rhodes map. Not even if you have troubles walking would a car be of great help to you as the whole old town is a pedestrian only area. If you’d like to go to the beach from the cruise ship, you won’t necessarily need a car in that case either. Elli beach, which is a public beach of Rhodes town, is only about a 20 minute walk from the ship. 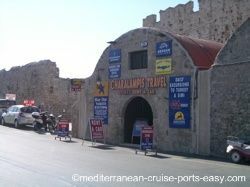 Renting a car in Rhodes is very easy as there are a couple rental agencies just across the road from the commercial port which is where your cruise ship will be docked. Just make sure you are early so you can get a car of your choice. 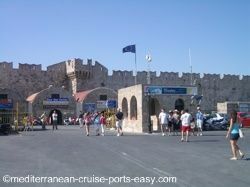 Time is a big factor for any cruise ship visitors to Rhodes island as you are responsible for returning to the ship on time. You're not one of those who want to be bothered with trying to find your way on roads you don’t know... trying to find parking while all you want is a swim in the cool Mediterranean sea, stress about getting back to the ship on time because you got lost? Hiring a taxi and an experienced driver that’s going to be your unofficial guide for the day, would be a better solution in these time-limited conditions. And as a little reminder at the end, please note that Greeks are not considered to be the most responsible drivers there are. They are often known for excessive speeding, ignoring red lights, being aggressive, no signalling for turns, reckless overtaking and disdain for traffic lights. So, if you do decide to go with car hire in Rhodes, arm yourself with a lot of patience, open your eyes and be extra cautious!